Hallmark has delivered some good news. 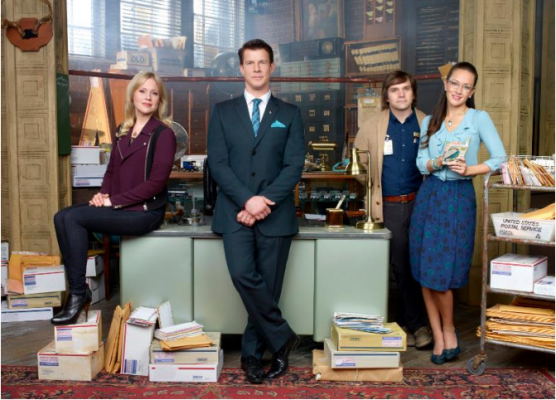 This week, the network announced their TV movie series Signed, Sealed, Delivered will return for the 2017-2018 season. The franchise began as a TV series in 2014. From Martha Williamson, the dramedy follows four postal workers who find the recipients of undelivered mail. After one season, Hallmark Channel rebranded the series into a TV movie franchise. The cast includes Eric Mabius, Kristin Booth, Crystal Lowe, and Geoff Gustafson. BEVERLY HILLS, CA – July 27, 2017 – Hallmark Movies & Mysteries, the premiere television destination for thrilling mysteries, will present a slate of new, original world premiere movies for its upcoming program schedule. Cable television’s fastest-growing network unveiled plans for new movie installments of its returning popular mystery franchises, along with two newly developed deals: one with Al Roker (“Today”) that stars Holly Robinson Peete (“Chicago Fire,” “Angel of Christmas”) and one with crisis management expert, Judy Smith. The announcement was made today as part of Crown Media Family Networks’ bi-annual TV Critics Association Press Tour. World”) and Geoff Gustafson (“Rogue”); “Hailey Dean Mysteries” starring Kellie Martin (“ER,” “The Guest Book”) and “Fixer Upper Mysteries” starring Grammy Award nominee Jewel and Colin Ferguson (“The Vampire Diaries”). What do you think? Are you a fan of the Signed, Sealed, Delivered movies? Are you glad there’ll be more? More about: Hallmark Movies & Mysteries TV shows: canceled or renewed?, Signed Sealed Delivered, Signed Sealed Delivered: canceled or renewed? I absolutely love this show!!!!! Since seeing the first show I have been hooked. I may be an old fashioned person but that is ok. With each new movie I am already looking forward to the next one. When is this show going to return. I feel that it was one of the best show out there. We really liked Signed Sealed Delivered and anxiously awaiting future episodes. I just saw Signed Sealed and Delivered for the first time about month ago. I have been wanting to see more. Are they still making the movies? I have watched Signed Sealed and Delivered from the beginning and hope you will continue to bring these good and wholesome shows to the Hallmark Movies and Mystery channel as I do love when they come on… They are definitely my favorites of all time. I would love for you to bring back Sign Sealed and Delivered. It is a wonderful mix of mystery laughter love and family TV.